United States Navy. 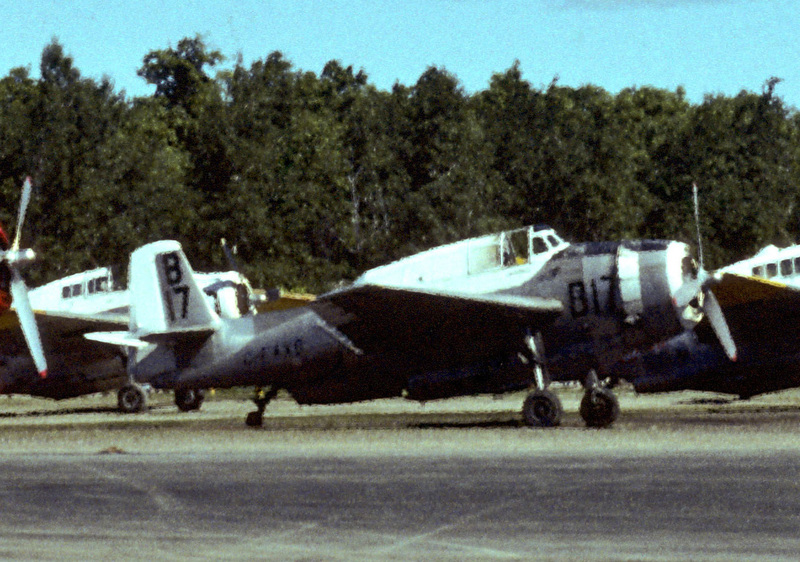 General Motors TBM-3E. Construction #: 3271. Major Oil Corp, Tucson, AZ, 1963. Registered as N7960C. Norman M. Poteet, Tucson, AZ, 1963-1964. 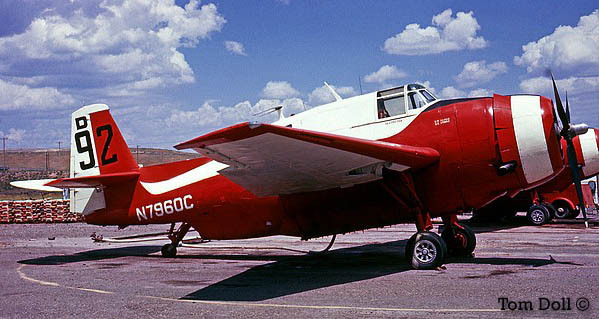 Sonora Aviation Inc., Tucson, AZ/Carson City, NV, 1966-1969, registered as N7960C, flew as D92. 1972 – Flew in Quebec 1972 only. Pilot Losee. 1973 – Pilot Losee. 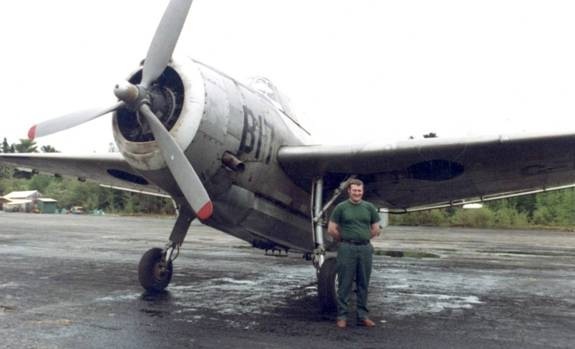 1974 – Pilots Inman and Angus. 1975 – Pilot Shalala. 1976 – Pilot Koerfgen. 1977 – Pilot Wilkie. 1978 – Pilot Farrell. 1979 – Pilot Farrell. 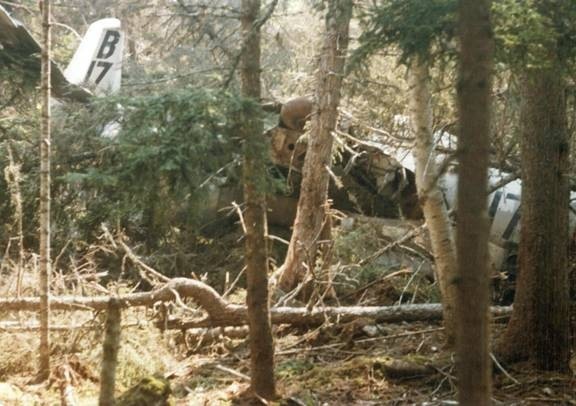 Crashed 15 June 1979, 2000 h. TBM FAXS piloted by William Farrell and owned by Norfolk Aerial Spraying Ltd. suffered a complete loss of power and crashed into a wooded area about 4 miles east of the North Branch Mullin Stream in central Northumberland Co. The pilot was not injured but the aircraft was destroyed. 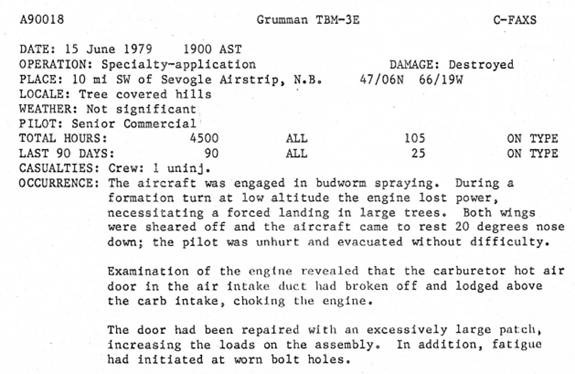 The pilot’s account of the accident and some images can be seen at The Sevogle Times. Norfolk #B17 with other TBMs parked at Boston Brook NB, June 1977. 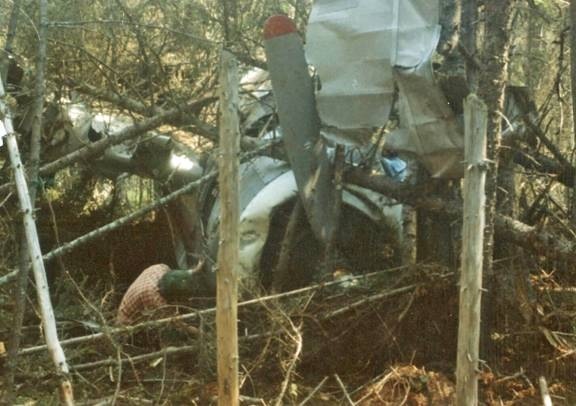 Norfolk TBM #B17 crash site, 1979.